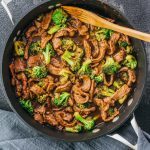 A low carb and keto friendly version of my popular beef and broccoli stir fry that's healthy yet doesn't sacrifice on flavor. Toss the sliced beef in a large bowl with corn starch until well-coated. Set aside. Heat canola oil in a pan over medium heat for a few minutes or until hot. Add sliced beef and cook until it browns, less than 5 minutes, stirring frequently. Transfer to a plate and set aside. Add broccoli florets to the pan and stir. Add beef broth. Let simmer until the broccoli is tender, about 10 minutes, stirring occasionally. While waiting for the broccoli to cook, combine all sauce ingredients in a sauce pan. Stir the ingredients together over medium-low heat until it starts to simmer, about 5 minutes. Keep the sauce warm over low heat as you wait for the broccoli to cook. Return beef to the pan and pour the sauce on top. Stir until everything is coated with the sauce. Bring to a simmer and cook for another few minutes. Season with salt and pepper to taste, if needed. Serve immediately, optionally pairing with cooked cauliflower rice. Drizzle sauce on top. This recipe yields 11.5 g net carbs per serving. Nutrition information does not include rice, and assumes erythritol is used as the sweetener, which cannot be digested by the body.